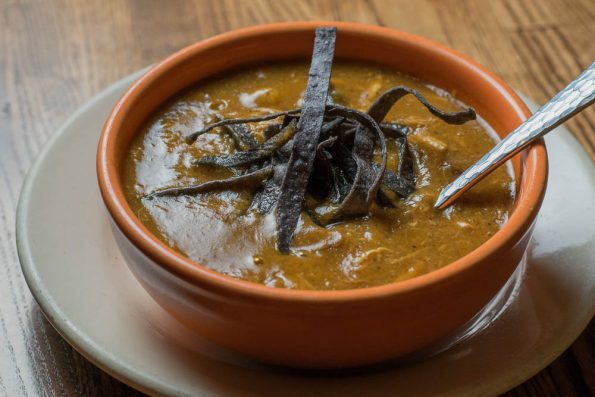 Z’Tejas‘ Tortilla Soup- Made in house daily with smoked chicken, jack cheese, cheddar cheese, and avocado, one might expect this to be a fairly standard tortilla soup. Well, they would be wrong! We had a fantastic meal there while working on a summer piece for the site and on a whim decided to try the soup. We were blown away by how much flavor there was and its richness. The cheese and avocado add another layer of flavor to this fantastic soup. 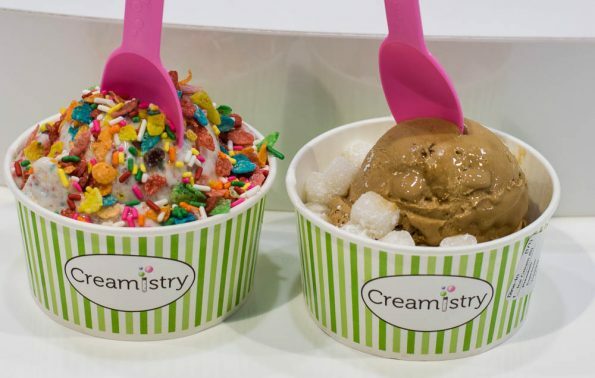 Creamistry Ice Cream- Nitrogen and ice cream?! Science and dessert make for a perfect stop for The Geeks. We decided to try them after dinner one evening and were astounded! Not only is it a blast to watch them prepare your ice cream, but they offer dairy free options (coconut ice cream anyone?) that taste fantastic! Add Fruity Pebbles and rainbow sprinkles or even mochi and we are sold! 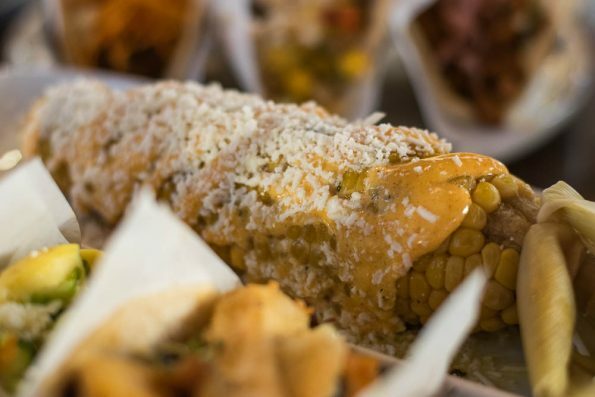 Taco Guild‘s Street Corn/Elote- Street Corn or Elote is all the rage currently. Typically it is an ear of corn covered in mayo, cheese, lime juice and seasoning. Taco Guild keeps theirs mostly traditional but instead of standard mayo, they use a habanero mayo which kicks it up a bit. Also importantly, they don’t over do it on the mayo which allows for enjoyment of all of the flavors present. Stingray‘s Godzilla Roll- As we said in our blog about Stingray’s convention defying rolls, “The Godzilla Roll probably best exemplifies an out of the box, non-traditional sushi roll. 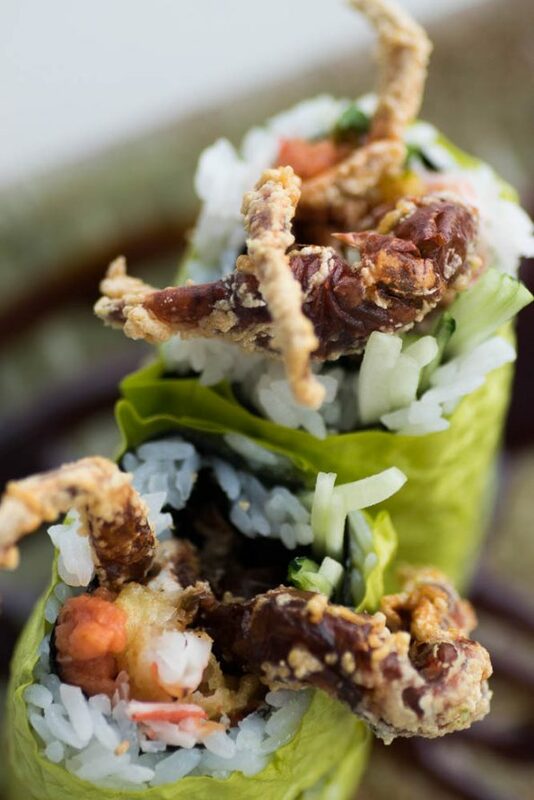 Not only is it wrapped in soy paper instead of nori, but it is also served upright versus on its side.” It also has some of the best soft shell crab we’ve ever had! Thirsty Lion‘s Scotch Eggs- Scotch eggs are probably one of the more different things we ate this past month. We’ve been a fan of them for quite a while and when we saw them on the menu at The Thirsty Lion we knew we had to order them! 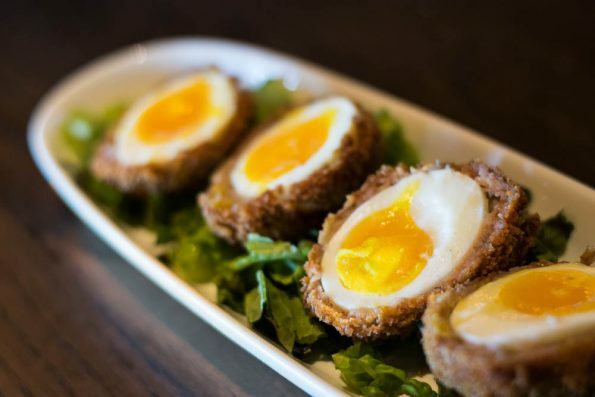 For those of you who are unaware, a Scotch egg is boiled egg wrapped in pork sausage, lightly breaded and crispy-fried. They are the stuff of dreams (at least our dreams). Thirsty Lion gets them right with flavorful sausage and a perfect soft boil on the egg! Well there you have it folks, the best things we ate in the month of May! June is already starting out strong and we will have more culinary delights for you next month! What were some of your favorite things that you ate last month? We’d love to hear! Leave a comment below or use the hashtag #GeekEats! Until next month, Happy Eating!